In 2008, the Radnor Historical Society and the Radnor Township Department of Parks and Recreation partnered to create two interpretive signs for the Radnor Trail. The signs, installed at Conestoga Road and Brooke Road, told the story of the Philadelphia & Western Railway, an interurban rail line that operated on the current trail between 1907 and 1956. 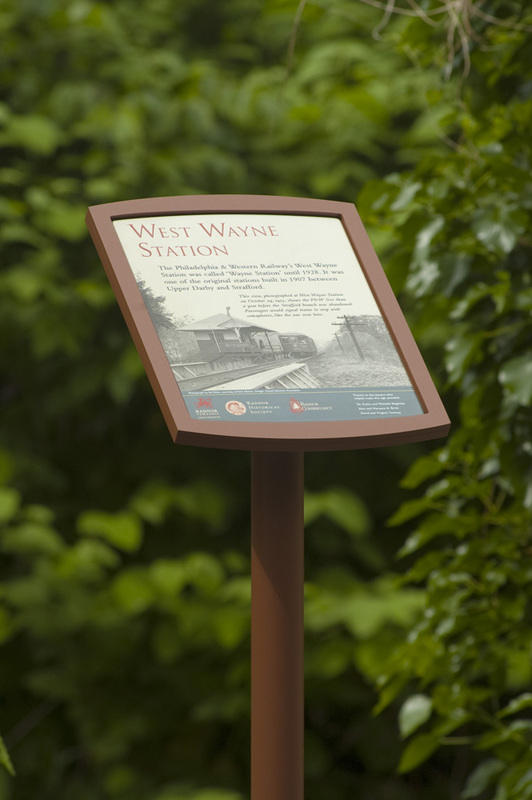 This spring, two new signs were installed at the sites of two former P&W stations, at West Wayne Avenue (pictured) and Sugartown Road. These panels display historic photographs of the long-gone stations and tell their stories. These signs are costly to produce, and were made possible thanks to contributions from the Radnor Conservancy and private donors. We would like to complete this project by installing signs at the sites of the remaining stations: Strafford, South Devon Avenue, Maplewood Avenue, Ithan, and Radnor-Chester Road. We can’t achieve this goal without you! To learn more and find out how you can help, please visit www.radnorhistory.org/trailsigns.